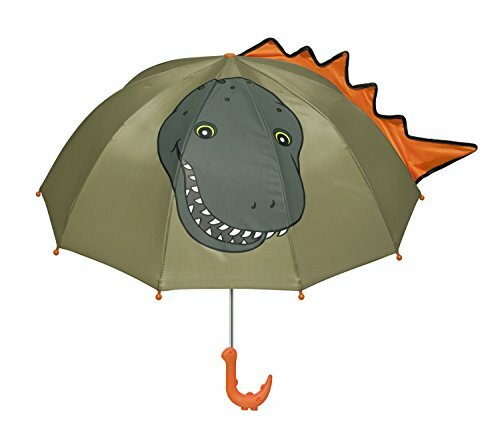 Kidorable Green Dinosaur Nylon Umbrellas are lightweight and kid-sized for little hands. Like all Kidorable umbrellas they have a fun, easy to grip handle, a Velcro strap for quick storage, and safety caps on the tips of the ribs to protect little faces. To complete the outfit, get matching Kidorable Dinosaur rain boots, coat, knitwear and more! Most Kidorable products are designed for children aged 2-6. Many of our products are available for babies, and children as old as 11. Kidorable delights both children and the adults who love them by transforming everyday, functional kids' accessories into objects that excite their imaginations and enrich their lives at play. Find the gear your kids will actually beg to wear. Raincoats, Rain Boots, Umbrellas, Backpacks, Hooded Towels, Hanger Sets, Knit Gloves, Hats, and Scarves, and more. Here you’ll find styles to spark any kid’s imagination—Shark, Dinosaur, Lucky Cat, Ladybug, Butterfly, Frog, and Lotus for animal and nature lovers. Pirate, Fairy, Mermaid, Ballerina, Fireman, Space Hero, Dragon Knight and Fireman for kids who dream big. Plus Dora the Explorer and SpongeBob SquarePants for kids who want to be their favorite characters. We believe in the power of imagination to make everyday families happier. Because a lot is at stake. More and more, children are forgetting how to create, to think, to explore, to connect. Over-scheduled, under-engaged, dulled by TV and video games, our kids are less and less able to amuse themselves, solve their own problems, or tell the difference between the character in the movie and the one trying to sell them cereal on TV. It's time someone said there's a better way. Someone like us. Someone like you. It's time that children and the adults who love them rely more on human beings for connection and guidance and entertainment instead of screens with shiny lights and buttons. It's easy. All it takes is someone who cares. And a little imagination. Won't you join us? What will you be? A Lucky Cat? A Shark? A Ballerina? Exploring kiddos have little fear but lots of curiosity--rain or shine. A little girl or boy with a nylon Kidorable child-sized character Umbrella explores their world in search of fun & adventure. Kidorable kids umbrellas come with a Velcro strap for quick storage, an easy to use push button closure & safety caps on the tips of the ribs to protect little faces. One size is large enough for big kids & light enough for little kids & toddlers to use. Kidorable took the umbrella and turned it into an imagination tent - kids will use them in rain or shine. Sure to be the cutest umbrella wherever you and your kid travel, add in matching Kidorable rain boots, hats, rain jacket, backpack, scarves & gloves. PREMIUM QUALITY: Kidorable Kids Umbrellas are strong enough to handle rainy day outdoor adventures. With an easy to grip handle for little hands, the waterproof nylon has a colorful, character design to encourage imaginative, active play in all weather. If you have any questions about this product by Kidorable, contact us by completing and submitting the form below. If you are looking for a specif part number, please include it with your message.